Some parents may prefer their kids to get separate Christmas presents, and I get that. In a few years, I am sure that I will feel that way about the boys, but for now I don’t mind, and actually encourage, family members to buy them “joint gifts.” At 21 months, one boy will play with the paper, one will play with the box, and the last will maybe play with the toy. Instead of individual toys, the boys enjoy larger toys that they can all play with or in at the same time. This leaves fewer toy pieces scattered around the house, and I feel like it encourages them to learn how to share and play something together. 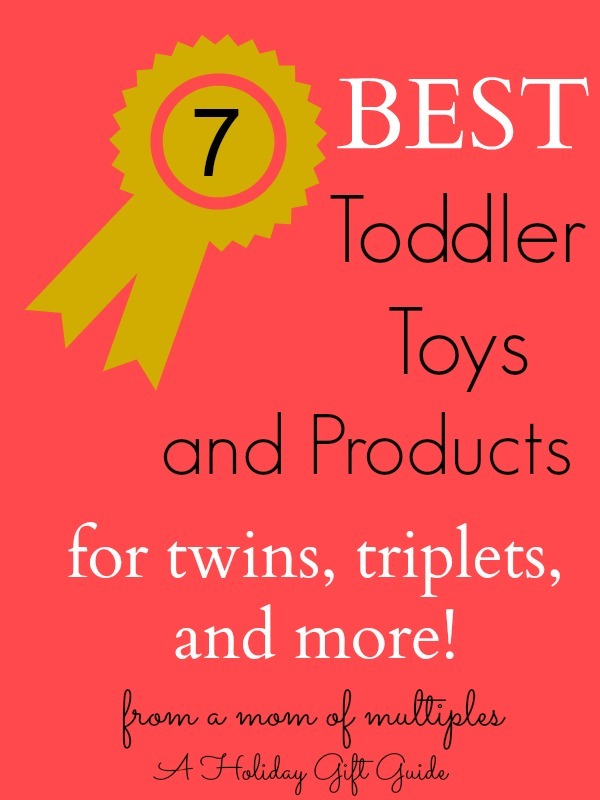 So if you’re a mom of multiples looking for the best toys for toddlers to share or a mom who has kids just a year or two apart, these are all excellent gift ideas. All of the items listed are larger toy ideas that are ideal for more than one child to play with at the same time. I’m sharing gift ideas that are 100% tried and true. As a mom of multiples, we have either owned or tried every item that is listed in today’s guide. These gift ideas are geared for toddlers, aged up to about three years of age, or a little older as applicable. First I do want to point out that moms of multiples usually have a large need of diapers and clothes. I know that is true in our case. If anyone asks what our boys needs for Christmas or birthday, I always say diapers and clothes. It’s just plain true! We go through a pack of diapers a day, and they go through clothes so quickly. My boys also have big feet, and I have to order their shoes in wide or extra wide from sites like Stride Rite. So be sure to find out if the mom your buying for has a specific need first. If not, or if you’re a grandparent wanting to splurge, then read on for these gift ideas! 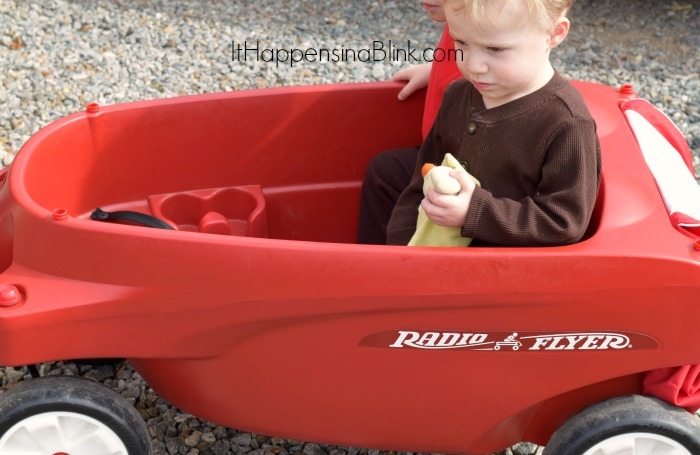 I have the Radio Flyer Wagon at the top of this guide for a good reason: They are simply awesome! We had a small Radio Flyer Wagon with our first, and we recently upgraded to the Triple Play Deluxe Wagon. 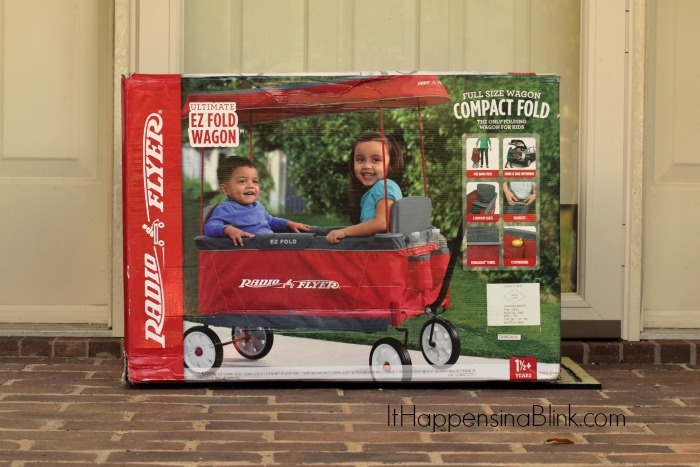 Radio Flyer makes quality, durable products, and the wagon has been no exception. Since purchasing the Triple Play Deluxe Wagon, we have actually gotten rid of our triplet stroller. There is no reason to haul around a cumbersome stroller when the wagon fills all of our needs! We have pulled that wagon around our yard, neighborhood, town (Trick or Treating), and Walmart. Here’s a photo of two of my boys in the wagon. The third was looking at the dogs. 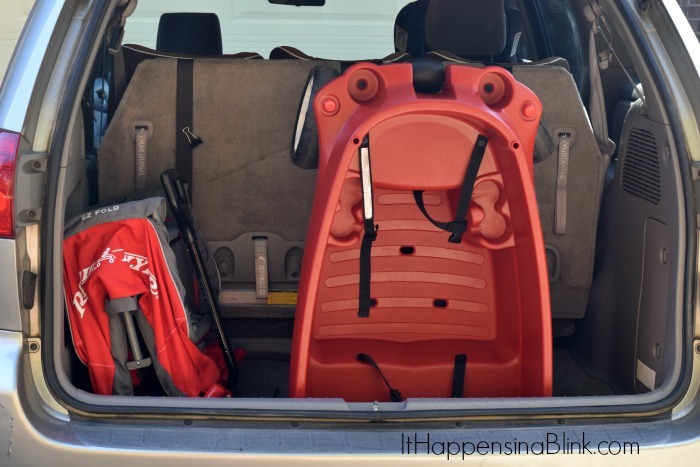 It has plenty of room, cupholders, and a bag in the back that is large enough to fit a diaper bag. It’s seriously awesome! And, in case you are wondering, yes, the wagon fits in the back of our van with room to spare. I even have room for my Ultimate EZ Fold Wagon on the side. 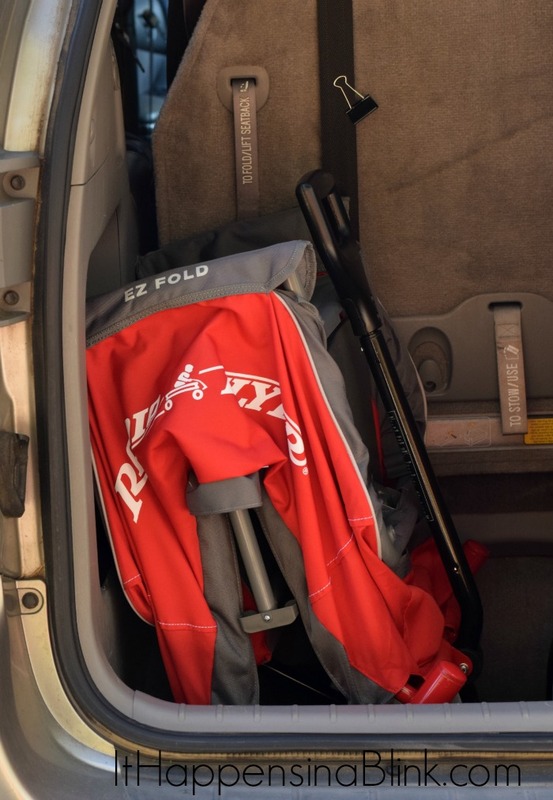 The Ultimate EZ Fold Wagon is a handy little product in itself. A huge thanks to Radio Flyer for sending me one to try out with my kiddos! Raise your hand if you went to the pumpkin patch this year. Wouldn’t an extra wagon to haul those pumpkins around in been awesome? 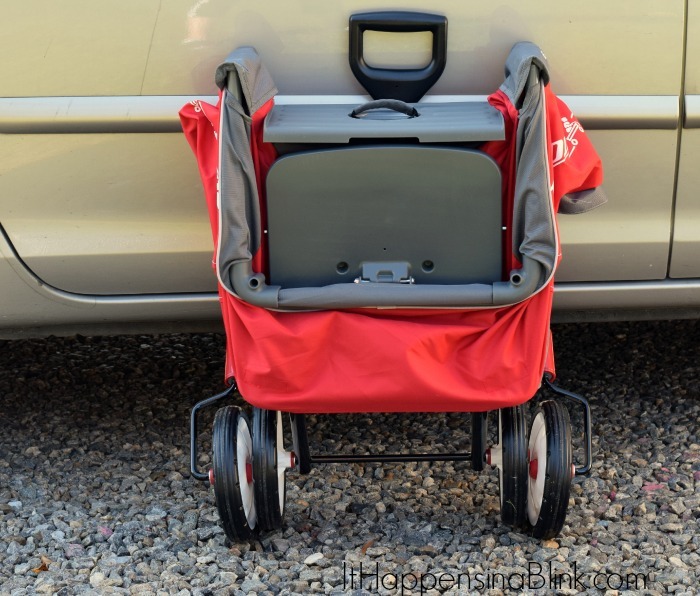 The Radio Flyer Ultimate EZ Fold Wagon only weighs 27 pounds, and it folds compactly in any vehicle while maintaining the typical wagon amenities like cupholders and a canopy. I also use mine on the days that I’m down to only two kids. We’ve enjoyed many fall walks in this wagon! 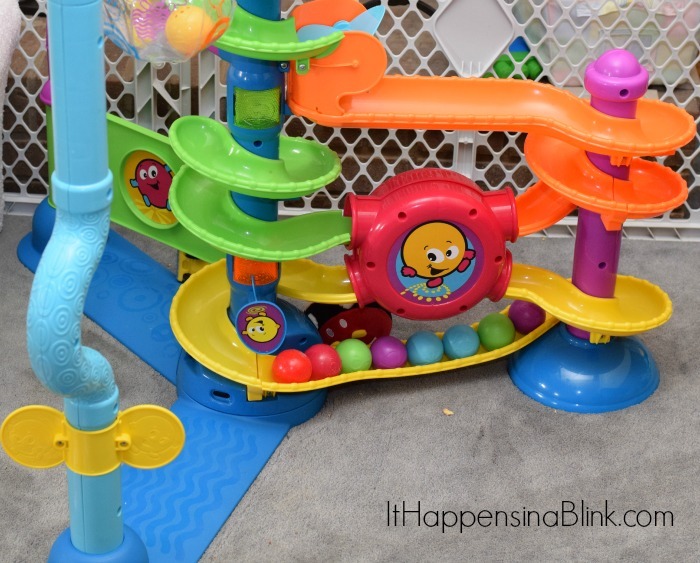 My boys received the Fisher-Price Cruise and Groove Ballapalooza for Christmas last year, and they still love it! They dance to the music or have races to see who can put the balls down the track the fastest. The inflatable ball that is attached at the top is their official first punching bag. My older daughter even likes playing with this toy, and any kid who visits our house is instantly drawn to it! 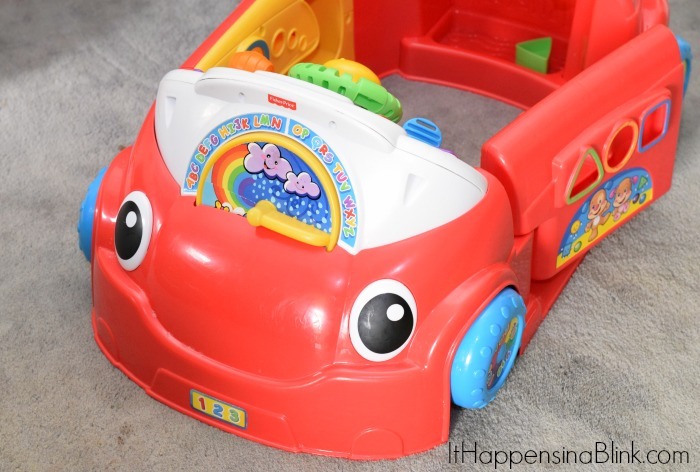 In addition to the Ballapalooza above, the boys received the Fisher-Price Laugh and Learn Crawl Around Car as their other Christmas gift last year. I like this one because, even though only one kid can fit in it at a time (I have caught all three of mine in there before. It looked like a clown car. ), there are activities all around the car that toddlers who are not inside the car can do. From shape sorting to spinning the wheel or using the windshield wiper, riding in the car is only half the fun! I was a bit nervous at first to get the Step 2 Up & Down Roller Coaster for the boys. After all, IT’S A LITTLE ROLLER COASTER! I felt like they may be too young, but I’ve found the exact opposite to be true. In only a matter of days, all three of the boys were riding the coaster like pros. And it had a by-product that I wouldn’t have imagined. It’s re-inforced the concept of sharing and taking turns, even at their young age. 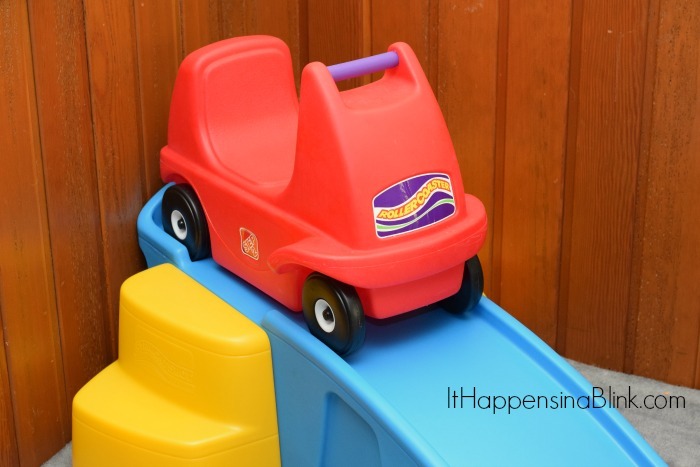 If you have a large playroom, the Step 2 Up & Down Roller Coaster can be used indoors in addition to outdoors. 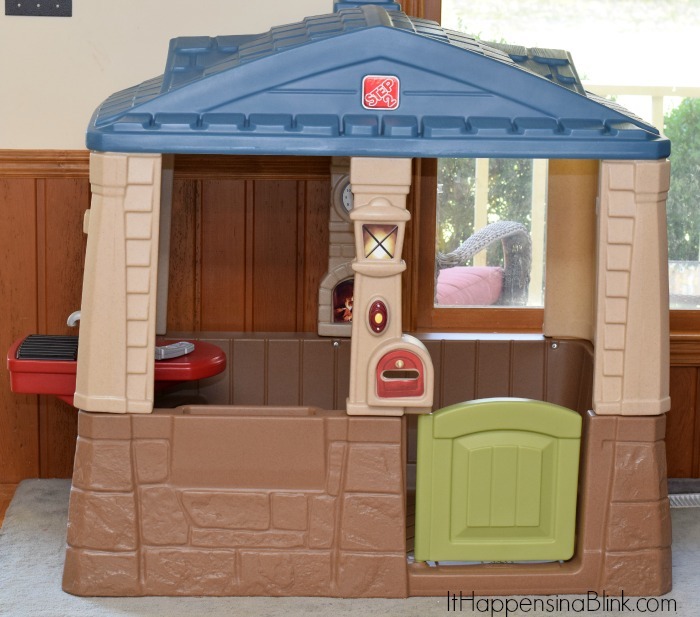 The Step2 Happy Home Cottage & Grill is the newest selection in my boys’ playroom. With a working doorbell, door, and play sink, my boys rarely let a waking hour pass without stepping foot in the cottage. I’m not going to write a lot about the cottage because I have something even better- a video! Our Step2 Naturally Playful Woodland Climber is in our outdoor play area. We originally purchased it for our daughter, but it has been awesome for our boys! My boys are climbers at heart, and the Step2 Climber gives them all an outlet for their energy. We have an older version of the Parents Magazine Bee Bop Band Play & Learn Drum & Instruments . It’s one that my daughter had, but we still have all the pieces. I bring the instruments out for music time each day. Perfect for multiple toddlers, they learn to share and make music together. 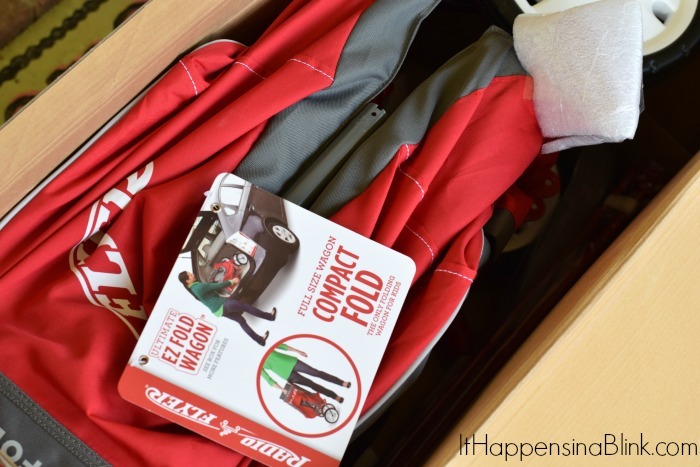 OH, I LOVE Radio Flyer products….they’re made so well! I wish the Radio Flyer we had folded like this! I’ve heard that Ballpalooza toy is awesome too. And lastly, we’ve had many Step2 items over the years and they all help up SO well! 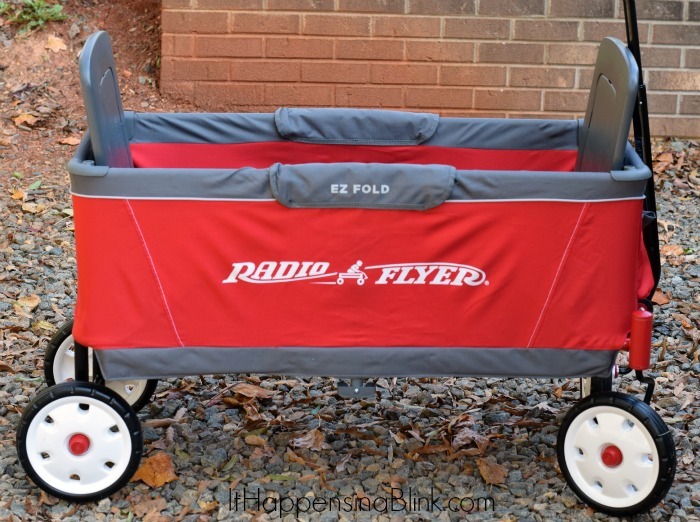 I love that Radio Flyer Wagon, what a great option for when you are traveling! That Step 2 Up and Down Roller Coaster looks so fun! I’m glad they got the hang of it! I love that the Radio Flyer wagon folds up. That would fit perfectly in our trunk. 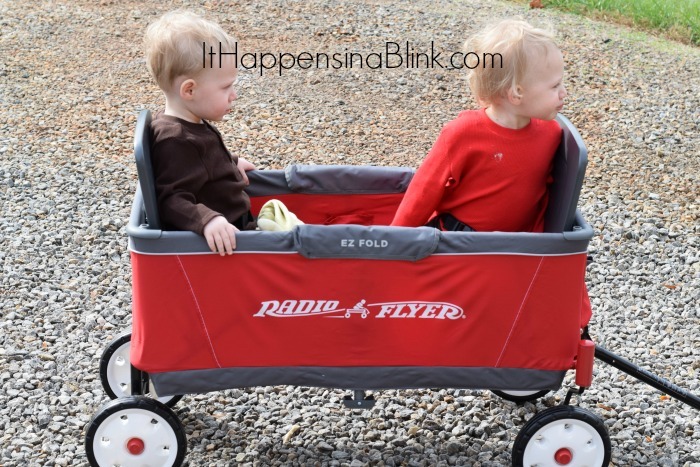 We have the classic Radio Flyer – but I LOVE that folding one!! These are all great suggestions. I have a toddler myself, and the EZ wagon looks great! Is there any kind of swing that would hold triplets? Hi, I have this one that holds two children: http://amzn.to/2rxv5Bx . They didn’t really start using it until they were three (it takes a lot of balance) and I’ve never had an instance where more than 2 wanted to ride at the same time. I know that there are other swings, like this one: http://amzn.to/2s6xIav that can hold multiple children, but I do not have one to speak from experience on how well it works.